How can I respond to this Line Graph? This graph is a little bit different from the others, so I am confused. Can you help me to describe this graph? As I remember we have to group the graph in two categories. In this graph the birth rate & population growth rate are similar and may be in one group, while the death rate shows different manner. exactly when the first group was falling down in 1955 the second one was growing up. And again while the first group was falling to zero in period of 2002 and later, the second group is going to rise in same period. Yes, it is a good idea to try and group things. This will make your answer easier to read and show you can compare and contrast. To help you do this look for similarities and differences. 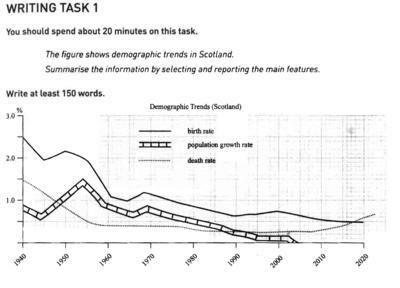 As the other poster mentioned, you could group the 'birth rate' and 'population' growth rate together from because they follow a similar pattern (though of course you would need to mention that the birth rate is higher). But they fall and increase in very similar ways. The death rate is quite different though. How to write about IELTS tables? Q1: How can I understand and write about acadamic task # 1 "describe the table" could you please let me know any tip to write about table. Comments for How to write about IELTS tables? A table though is much the same as writing about a graph - the information is just presented in a table instead. So you need to identify if it is over time (then you use language of time) or if it is not then you just compare and contrast the data. How can I describe IELTS Maps? I need some advice on how to describe maps....Can someone help me out?? Comments for How can I describe IELTS Maps? For maps the important thing is to learn language of compare / contrast (as you may have to compare two maps) and language that discusses location as you will have to explain where things are. How do we write about IELTS Maps? What is the process of writing the maps? Comments for How do we write about IELTS Maps? Maps are one of the easiest to describe as we as the writer just have to illustrate the changes made in it. Let me take an example of an island where in the past there was barely anything and in some quick years people built it like a resort. We just have to make sure that we use every single information given to us, either it be the scale which is shown under or pathway or anything which can show the reader how glorifying the map would be! How do we write about flow charts? is there any suggestion in writing a flow chart for IELTS writing task 1? Comments for How do we write about flow charts? Do you mean IELTS Process? Does process chart include conclusion separately...??? It's the same for any Task 1. You can have to conclusion, but you don't have to. What you must have (usually placed at the beginning or at the end as a conclusion) is an overview showing the main trends or patterns that are occurring, be it a process, graph or map.